It is commonly thought that the Arabs were majority illiterate before Islam. 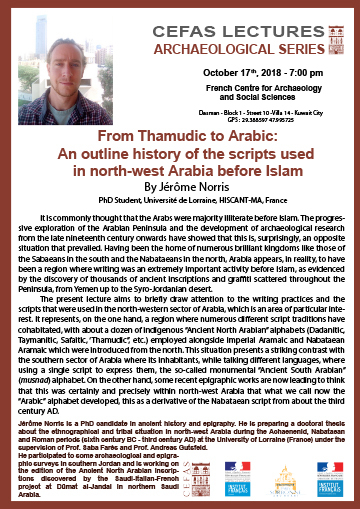 The progressive exploration of the Arabian Peninsula and the development of archaeological research from the late nineteenth century onwards have showed that this is, surprisingly, an opposite situation that prevailed. Having been the home of numerous brilliant kingdoms like those of the Sabaeans in the south and the Nabataeans in the north, Arabia appears, in reality, to have been a region where writing was an extremely important activity before Islam, as evidenced by the discovery of thousands of ancient inscriptions and gra-ti scattered throughout the Peninsula, from Yemen up to the Syro-Jordanian desert. scripts that were used in the north-western sector of Arabia, which is an area of particular interest. It represents, on the one hand, a region where numerous di-erent script traditions have cohabitated, with about a dozen of indigenous “Ancient North Arabian” alphabets (Dadanitic, Taymanitic, Safaitic, ‘Thamudic”, etc.) employed alongside Imperial Aramaic and Nabataean Aramaic which were introduced from the north. This situation presents a striking contrast with the southern sector of Arabia where its inhabitants, while talking di-erent languages, where using a single script to express them, the so-called monumental “Ancient South Arabian” (musnad) alphabet. On the other hand, some recent epigraphic works are now leading to think that this was certainly and precisely within north-west Arabia that what we call now the “Arabic” alphabet developed, this as a derivative of the Nabataean script from about the third century AD. surveys in southern Jordan and is working on the edition of the Ancient North Arabian inscriptions discovered by the Saudi-Italian-French project at Dūmat al-Jandal in northern Saudi Arabia.